The last time Vincent Forras saw fellow firefighter and 9/11 responder John McNamara alive, he barely recognized him. "Johnny Mac," as he was known to friends, was stricken with colon cancer and the disease had ravaged his body. Though just over 40, the once-strapping FDNY veteran looked two decades older. The fireman's muscular frame had been sapped by the effects of chemotherapy and multiple operations. "You could see the life being drained from him," Forras recalled. McNamara, who worked 500 hours in recovery efforts at the World Trade Center, lost his battle with cancer last month. The 44-year-old left behind his wife, Jennifer, and two-year-old son, Jack. The firefighter's death marks the latest chapter in the ongoing plight of first responders who have developed life-threatening illnesses after toiling amid the toxic pile at ground zero following the Sept, 11, 2001 terror attacks. While the array of 9/11-related afflictions is well documented, the number of those who have succumbed to their diseases is not. Health officials say they are not yet able to pinpoint the number of casualties directly linked to ground zero exposure. Advocacy groups claim the death toll has already topped 800. McNamara's family and colleagues are convinced his aggressive colon cancer was caused by his exposure to the dangerous blend of chemicals wafting where the twin towers once stood. However, like most first responders who are sick, that formal recognition has never come. Since McNamara's death was not considered a line-of-duty casualty, he was denied a city fire truck at his funeral procession. The snub still stings for his wife Jennifer. "John may have not died on 9/11," she said eulogizing her husband. "But it was his work there that killed him." Unlike some of his colleagues, Vincent Forras is still alive eight years after terrorists brought down the World Trade Center towers. But he lives with the nightmare of that day. The former fire lieutenant spent several weeks digging through the debris at the disaster site. A frantic rescue mission turned rapidly into a grueling recovery effort - 16-hour shifts amid a web of rubble, body parts and toxic powder. Steaming hot dust clouds spewed from the pile. The smells and colors were "beyond description," Forras says. At one point, he slipped and fell down a beam on the South Tower side, burying himself in the debris for two hours. Even when he managed to free himself, he could barely breathe. Forras says that workers rarely slept and were given a stockpile of steroid inhalers to help them breathe. The short-term fix enabled teams to continue digging through the rubble, where they inhaled a carcinogenic cocktail of asbestos, jet fuel, mercury, lead and pulverized cement and glass - a multi-chemical exposure that medicals experts say is unprecedented. "Health wise, we really took a beating down there," Forras said. Today, the Queens native lives in Ridgefield, Connecticut with his wife, his children - and a plethora of health issues. Respiratory ailments, intense headaches, memory loss and insomnia have plagued Forras for years. He takes more than two dozen medications and uses multiple inhalers to breathe. The dangerous mixture of particulate matter he ingested is still working its way out of his body. Several years after 9/11, his wife, Monica, says she was picking tiny shards of glass out of his skin. "We have a finite period of time and the records show how fast we're losing guys," Forras said. "This is an unfolding tragedy that's accelerating." Gauging the health effects of the World Trade Center exposure is an enormous task and an inexact science. About 43,000 have been physically screened for 9/11-related health issues in New York. Twenty-eight thousand are in the World Trade Center Medical Monitoring and Treatment Program and 15,000 are enrolled at a sister program at the FDNY. Meanwhile, the WTC Health Registry has tracked the health effects of 71,000 workers, volunteers and residents though surveys. While the WTC program provides comprehensive treatment for eligible participants, it doesn't cover every medical condition that a responder develops. Ailing workers must have a condition that is on the list outlined by the National Institute for Occupational Safety and Health. Nearly all of the studies released on World Trade Center exposure draw the same conclusions: people at or near ground zero reported higher levels of asthma, respiratory problems and post traumatic stress disorder compared to the general population. Last month, a study found that a small number of young police officers who participated in the 9/11 recovery effort had developed an immune system cancer. The disease - multiple myeloma - is typically found in people well over 60 years old. The 9/11 responders who had the disease were all under 45. Dr. Jacqueline Moline, the study's author and director of the WTC program, says it's too early to link many of the health problems definitively with 9/11. However, she concedes that doctors are exploring uncharted territory. "We don't have good science about mixed exposures," she said. "We've got people who were exposed to chemical A or chemical B but not chemical A and B and certainly not chemical A through Z all together - plus the collapse and dust… It was of a magnitude and the number of people exposed was higher than anything (before)." Doctors have characterized the pattern of 9/11 health problems as occurring in three waves. The first refers to the "Word Trade Center cough" and respiratory problems developed immediately after Sept. 11, 2001. The second comprises severe chronic lung diseases. The third wave includes diseases like cancer that "might take many years to develop," Moline said. But what medical professionals classify as "many years" is right now for some first responders. John McNamara was 40 when he was diagnosed with stage 4 colon cancer - five years after the terrorist attack. "You just don't find a cancer with that kind of aggression in that young of a person," Jennifer McNamara said. "It's less than 10 years down the road and there are already a lot of people dead. Forget about first being diagnosed, there are a lot of people who are dead." How many have died? It's impossible to pinpoint a number. 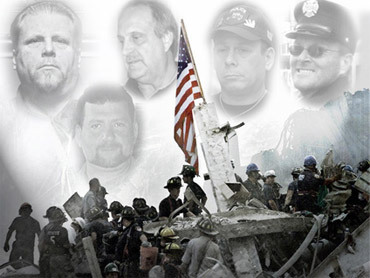 An FDNY spokesman told CBSNews.com that at least 20 deceased firefighters were granted line-of-duty death classification under the WTC Presumptive Bill, which provides disability coverage for sick 9/11 responders that meet specific criteria. The NYPD recognizes 22 police officers who died from ground zero exposure on its "Wall of Heroes," according to the 9/11 Police Aid Foundation. Those tallies, of course, don't include casualties not officially linked to 9/11 nor do they account for deaths of non-uniformed responders. John Feal, a ground zero responder whose foundation works on behalf of sick 9/11 workers, says the New York State Department of Health has confirmed more than 800 deaths linked to World Trade Center exposure. The agency did not respond to CBSNews.com's request for comment. "Why do we have to fight?" Sick 9/11 responders are not just suffering physically. Some say the emotional and psychological trauma is equally unbearable. Many complain they are being denied medical care and claims through a multi-layered wall of political gridlock, city red tape and legal stonewalling. Government spending in recent months has only fueled their anger. Many are upset that so many dollars are being spent on failed banks and automakers while sick workers who responded to America's worst attack in history are still fighting for medical care. Two funds established in the wake of 9/11 have come to epitomize the responders' frustration. Sick workers say the Victim's Compensation Fund failed to adequately cover them and the initial deadline to enroll expired in 2003 - well before some of the most serious diseases began to manifest themselves. Meanwhile the Captive Insurance Fund, set up to reimburse injured World Trade center workers, has consistently fought claims by ill first responders. "I just don't understand it," said retired NYPD detective Glen Klein, who spent over 800 hours at ground zero with the Emergency Service Unit. "Why do we have to fight for benefits?" Klein (at left at a D.C. rally) suffers from asthma, gastro intestinal problems and lung scarring, but the 51-year-old says the emotional and financial burden is just as painful. He says he started drinking heavily in 2003. He punched holes in the wall and nearly destroyed his marriage. Bureaucratic snubs have deepened his bitterness. While trying to get a disability pension, Klein went before the NYPD medical board five times - only to be denied five times. "I've been diagnosed with all these illnesses and I've been told by six different doctors I could never perform the duties of police officer again," he said. "I haven't worked. I'm not making any money. The social security board acknowledges that I'm sick. Why doesn't the police department board acknowledge I'm sick?" Other responders report similar frustrations. Tom Magee, a Red Cross volunteer who broke his back after working 10 months in the ground zero cleanup effort, narrowly missed qualifying for a pension at his two jobs. The 48-year-old welder (at left at ground zero) used to make nearly $200,000 between the jobs. After being denied federal workman's compensation, he now gets just $400 a week in state compensation. Magee, who suffers from progressive lung disease and speaks in labored breaths, is part of a third party lawsuit against the city. It has languished for eight years. Retired police detective Mike Valentin, 44, was diagnosed with Hodgkin's lymphoma, sarcoidosis and several inoperable tumors. Medical bills forced the father of three to lose his house and move back in with his parents. Valentin (at left with his medications) is disgusted by what he regards as callous treatment of first responders by the powers that be - sick responders being denied disability pensions, cancer diagnoses being dismissed as "statistical anomalies" and mounting legal fees to block 9/11-related lawsuits. "I have been given a death sentence," said Valentin, who started the 9/11 Police Aid Foundation. "I see the injustice being done. I would never leave a fallen brother or sister behind." A long-awaited lifeline may be coming for sick 9/11 workers. In June, lawmakers introduced a bill in the Senate to provide $12 billion in medical treatment and monitoring to 9/11 responders exposed to the toxic dust at ground zero. The James Zadroga 9/11 Health and Compensation Act, named for an NYPD detective who died after working at ground zero, would reopen the Victim's Compensation Fund. A similar bill was shot down last year, in part because New York City officials were reluctant to foot part of the costs. "We have an undeniable moral obligation to help the heroes of 9/11 and all others exposed, and failure to do so may have long-lasting implications on future response efforts," said Sen. Kirsten Gillibrand, D-N.Y., who introduced the bill. Gillibrand's office told CBSNews.com that the bill includes two provisions that may allow for an individual to be treated for conditions such as cancer that are not in the existing WTC program. The legislation is a glimmer of hope for people like Alex Sanchez, who spent six months doing cleanup at the buildings surrounding the World Trade Center after 9/11. The 42-year-old, who is enrolled at Mount Sinai's WTC program and assists Latino workers plagued by 9/11 illnesses, says the bill is long overdue. "The facts are there," Sanchez said. "It's a matter of doing the right thing." A nearly identical version of the Zadroga bill was also introduced in the House. On the brink of the eighth anniversary of Sept. 11, 2001, neither piece of legislation has passed. While the politics of the 9/11 health crisis remain in limbo, many of the first responders do not. Both Greg Klein and Alex Sanchez work on behalf of the FealGood Foundation; Mike Valentin regularly tours the country to bring awareness to the issue. As for Forras, he says his greatest fear is that people will forget about the terror attack's delayed victims. In honor of 9/11, he launched a foundation which donates firefighting equipment worldwide. His organization is set to donate a fire truck in the memory of John McNamara. His widow's grief, meanwhile, is tinged with resentment. Jennifer McNamara says her husband's death is no different from those who perished on Sept. 11, 2001. "Nobody wants to recognize that my husband served 500 hours down at ground zero giving other people closure and digging for other people and his illness is a direct result of that," she said. "Nobody's given me any closure," she said. "I have a two-and-a-half year old son to raise by myself now. So it would be nice if somebody admitted it. That was one of his dying wishes."